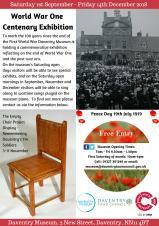 To mark the 100 years since the end of the First World War Daventry Museum is holding a commemorative exhibition reflecting on the end of World War One, its aftermath and post-war Daventry. On Saturday open days in September, November and December visitors will be able to sing along to wartime songs played on the museum piano. Exhibition open from 1st September to 14th December. 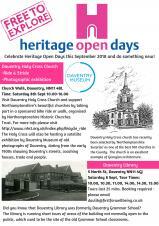 Celebrate Heritage Open Days this September and explore your local heritage for free! The Holy Cross Church will be hosting a satellite exhibition by Daventry Museum of photographs of Daventry dating from the early 1900s. The photographs show Daventry's streets, coaching houses, trade and people. Did you know that Daventry Library was formerly the site of Daventry Grammar School? The building was officially opened as Daventry Grammar School on 11th November 1938. Daventry Library is running short tours of areas of the building not normally open to the public, which used to be the site of the old Grammar School classrooms. Mike Arnold will be leading this walk and sharing his knowledge of the geology, nature and history of this beautiful location. The walk looks at the history of the hill from its formation in the Jurrassic about 140 million years ago, through the geological period to the human occupation of the hill starting in the Neolithic period, then the Bronze and Iron Age occupation, including the role with the BBC, the town water supply and many other aspects of the hill through the ages. There is also information on the flora and fauna as well as the extensive views from the hill. The walk is 2 miles over grass tracks with some gravel tracks. Some areas are inaccessible to wheelchairs or need the ability to walk over steep slopes and very uneven ground. These areas can however be by passed on the rough tracks. Booking is preferred, please email cllr.arnold@daventrytowncouncil.gov.uk or call 01327 301246 to book your place. 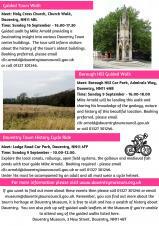 Sunday 16th September at 10.00 (Tour lasts 2 hours). A cycle ride around the outer reaches of the history of Daventry Town – Explore the local canals, railways, open field systems, the gallows and medieval fish ponds with tour guide Mike Arnold. Booking is required for this cycle ride. Please email cllr.arnold@daventrytowncouncil.gov.uk or call 01327 301246 to book your place. The cycle ride is mostly on cycle paths or cycle lanes with a few sections on quiet roads. The ride is not appropriate for under 5s cycling on own bicycle and children aged 16 and under must be accompanied by an adult. Please remember to wear a cycling helmet. A fascinating guided walk through the history of Daventry Town Centre from the Roman to the present day, led by Mike Arnold. The walk explains the reason for the layout of the town and how it came into existence, as well as informing visitors about the history and previous usage of the town's oldest buildings. If you are a baker, chef, or purveyor of food and would like to be involved, please email events@daventrytowncouncil.gov.uk for more information. XHTML 1.0 validated. WCAG compliant. Page generated in 0.1441 seconds.